An interior orientation is needed to compute a photogrammetric model used to orthorectify remotely sensed imagery. Interior orientation establishes the relationship between the image plane and the projection center of a camera. Interior orientation can be computed and refined using the fiducial marks visible on scanned aerial photography, along with other measurements associated with the focal plane and lens system of a metric camera. 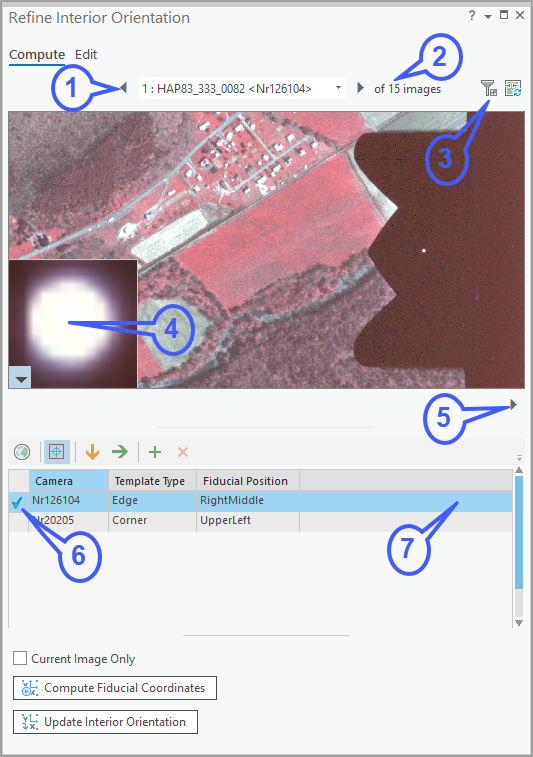 Creating an orthometric mapping workspace initializes the image interior orientation based on the entire scanned aerial photograph, without considering the valid areas defined within fiducial marks. Additionally, the orientation of the photograph during scanning may introduce systematic anomalies that can be compensated for in the processing workflow. The image interior orientation can be refined by detecting image fiducials using a fiducial template and constructing the affine transformation from computed fiducial image coordinates and known fiducial film coordinates. A fiducial template is a picture of a fiducial mark with required properties such as camera ID, scanned pixel size, and fiducial position. A fiducial template table stores the fiducial templates, and the Refine Interior Orientation pane can be used to define fiducial templates, calculate fiducials, and refine the interior orientation. Refer to the supported fiducials and the tips in the Fiducial template section below to define your fiducial templates. To automate the workflow for calculating fiducials, use the Compute Fiducials and Update Interior Orientation geoprocessing tools. The Refine Interior Orientation pane can be used to define a fiducial template table that is used by the geoprocessing tools. Scanned aerial images have two types of fiducials: corner fiducials and edge fiducials. Some images may have only corner fiducials, others may have only edge fiducials, and some may have both types. When an image contains identical corner fiducials and identical edge fiducials, you can define two templates, one for each type of fiducial. When fiducials are not identical, you can make them generic by capturing only the identical part. For example, the number next to the fiducial in the example below should not be included in the capture. Images might be rotated during scanning, so the film coordinate system (FCS) is used to describe the scanning orientation and is used in calculating fiducials and image interior orientations. 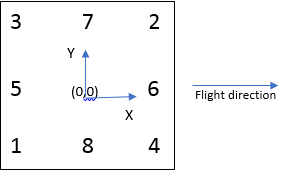 The positive X of the FCS always points in the same direction as the flight direction. For example, if the image on the left represents the flight direction, and you rotate the image 90 degrees clockwise when you scan it (the image on the right), the FCS for the rotated image will be X_DOWN_Y_Right. The fiducial template stores all the required information associated with measuring and managing fiducials. The fiducial template table manages fiducial templates and supports the tools used in the refinement of the interior orientation using the information stored in the fiducial templates and table. Stores the path to the fiducial photo. The fiducial photo can be a stand-alone photo in TIFF, PNG, or JPEG format. The fiducial photo can be a portion of the fiducial image, which is defined by the size (width and height) and center location (CenterRow and CenterColumn) in the image. If the image is an item in a mosaic dataset, the path syntax is the MosaicDataPath\objectid=id, where id is the ObjectID value of the image. For example, c\data\fgdb.gdb\md\objectid=1. A relative path is supported. If only the image file name is provided, or a path does not exist, it will search for the image from the folder of the fiducial template file. The pixel size used in the fiducial photo, which is typically the scan pixel size. The unit is microns. The width of the fiducial template in pixel units. This is needed only when the fiducial template is defined by a portion of the image. The value is in the image space, and the origin is the upper left corner. The height of the fiducial template in pixel units. The row of the center of the fiducial template of the entire image. The column of the center of the fiducial template of the entire image. The Refine Interior Orientation pane contains Compute and Edit tabs. The Compute tab allows you to define fiducial templates and compute fiducials. The Edit tab allows you to review fiducials, manually edit fiducials, and apply an affine transformation to the scanned images using the fiducials to refine image interior orientation. You can also use the Edit tab to correct the FCS of a scanned image. To activate the Refine Interior Orientation pane, the film fiducial coordinates of the camera must be provided when creating the scanned orthometric mapping workspace. 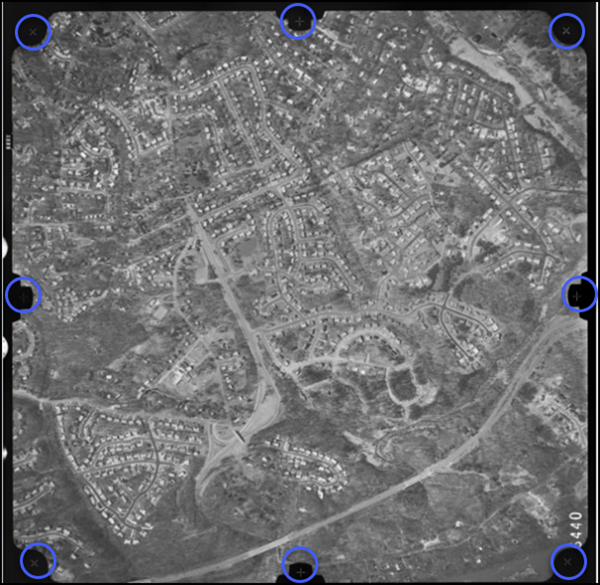 Since scanned images are generated from historical aerial photographs, and many of them may not have a camera calibration report with detailed fiducial film coordinates, you can enable this workflow by estimating film fiducials using the method suggested in How to estimate film fiducials. The name in the text box reflects the image name prefixed with the corresponding ObjectID from the footprint table. Click the arrow to display the next image, or choose an image from the drop-down box. The total number of images defined by the filter, camera selection, or map selection. The pop-up window displays a picture of the current template. Click the arrow to pan to the next fiducial position in the current image and display scale. A blue check mark indicates that the picture in the pop-up is defined for the current template. Select a specific row to display in the template and pop-up picture for the corresponding fiducial position. A red X indicates the position of the fiducial point that is being edited. The FCS of the current image. Use the Filter drop-down box to find images that are not resolved, or are resolved with only three match points. Use the Edit tool to add or edit a fiducial point. Click the Edit tool, and click the center of the corresponding fiducial in the preview window. Select a row to edit or view a specific fiducial point. The workflow to refine the interior orientation of scanned aerial photography is described below. The workflow includes how to define and populate fiducial templates, build and edit the fiducial template table, compute the fiducials, and refine the interior orientation. Open the Refine Interior Orientation pane, and click the Compute tab. The fiducial template table displays with the minimum number of templates that you need to define. Define the fiducial templates by capturing a fiducial picture for the existing templates, adding a template to the templates table, or importing a predefined fiducial templates table. Click the template in the fiducial template table for which you want to capture picture. Optionally use the next button to display the next fiducial of the same fiducial type in the current image. Press Ctrl + C and move the pointer to zoom or pan the image if necessary. Use the combo box to choose another image if you can't find good fiducial marks in the current image. The image display in the preview window uses a default renderer defined in Option > Image and Raster > Appearance, and it can be redefined if necessary. Click the Capture Fiducial button to draw a rectangle around the fiducial by first clicking the center and then clicking a corner of the rectangle. To change the picture of a template, recapture it. To clear the template picture, right-click the template and choose Clear Template from the context menu. The captured picture is automatically written to the fiducial template table in the orthometric mapping workspace. You may want to add or delete templates to accommodate image quality issues or unsymmetrical fiducials. The algorithm uses the first template for the same camera and fiducial type. If it fails to find a match, it will use the next template. In the template table, select a template with the same camera and template type as you plan to add, and click the Add To Project button . A template for the same camera type is added to the table. Select the newly added template and click the Capture Fiducial button to capture a picture of it. To delete a template, select the template in the table and click the Delete button . Each camera has a minimum number of templates. You cannot delete all templates. You can import a predefined fiducial template from a fiducial template file. Exporting the templates outputs a folder that contains both the template file and the referenced pictures of the fiducials. Once you've defined the template, you can compute the fiducials. Click Compute Fiducial to compute fiducials for all images defined in the image list. To compute fiducials for images from all cameras, click Clear Selection to remove the filter. The image list is updated by selections made in the map. 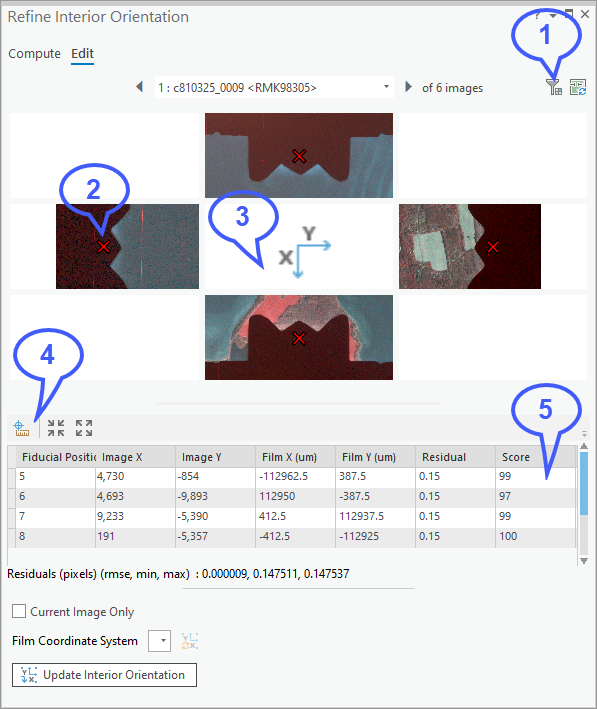 You can select images in the footprint table and calculate fiducials for the selected images. To calculate fiducials for the current image, check the Current Image Only check box. You can review and edit fiducial points using the Edit tab when fiducial calculation fails for an image. In the fiducial point table, values in the ImageX and ImageY fields are calculated image fiducials, and values in the FilmX and FilmY fields are the film fiducial coordinates of the camera that are provided during workspace creation. The Score field, with a value between 0–100, describes the similarity of pixel values in the template and image at that fiducial position, where 100 means a perfect match. The Residual field is the transformation error at that fiducial position. Use the Unresolved predefine filter for the case where fiducial matching failed and no image fiducial points are detected. Use the Resolved with only 3 match points filter to find images that need to be reviewed and edited,. Select a fiducial point row in the table and examine the corresponding values in the table. Check the preview; the corresponding point fiducial point should fall on top of the fiducial center. Press Ctrl + C to pan or zoom. Click the Measure Fiducial button to activate the Measure Fiducial editing fiducial coordinate tool, and click the center of the fiducial mark in the preview window. The image coordinates for this position are updated in the table. Select another row in the table and repeat the same steps to measure other fiducials. You can also review and redefine templates, and recompute the selected images. The Apply tool pertains to the images defined in the image list. The selection made from a map or a filter defined by the selected template will affect the image list. You can use the Apply tool when you've completed your review and edits. Click the Apply button to update the image interior orientation using the affine transformation computed from the fiducial image and film coordinates. Check the Current Image Only check box to apply the update to the current image. If your images are rotated on the map, the film coordinate system does not match the scanned orientation. In this case, select the affected images and correct the film coordinate system using the Update FCS tool. When a camera calibration report is not available, and you want to calculate image fiducials to improve the interior orientation, you need to estimate the film fiducials from the frame size and scan pixel size. The focal plane of traditional analog metric cameras is usually either 32 cm by 32 cm or 16 cm by 16 cm for older cameras. When you measure image width, remove the black boundary, and measure the size of the valid area in pixel space. 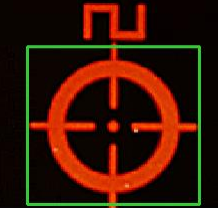 Since scanner pixel size is designed in micrometer intervals, or quarter of ten (such as 10,11,12,12,5,13,14,15,16,17,17,5,18,19, and so on), round the estimated scan pixel size to one of these. For example, The estimated frame size is 23000 um, the image left boundary consists of 232 pixels, and the right boundary is 16609 pixels. Thus, the estimated scanned pixel is 230000/(16609 - 232) = 14.04 um. The result is rounded to 14.0 um. Measure the fiducial marks in pixel coordinates (rows and columns). Compute the center of the measured fiducials as the location of principal point, and transform the original to the center. Scale these coordinates using the scan pixel size (origin is the upper left corner) to the film coordinate system, where the origin is the center with positive X is to the right and positive Y is up. You've populated the fiducial template with the information needed to compute the fiducials and refined the interior orientation. This information is used to compute the photogrammetric model to produce orthometric mapping products.